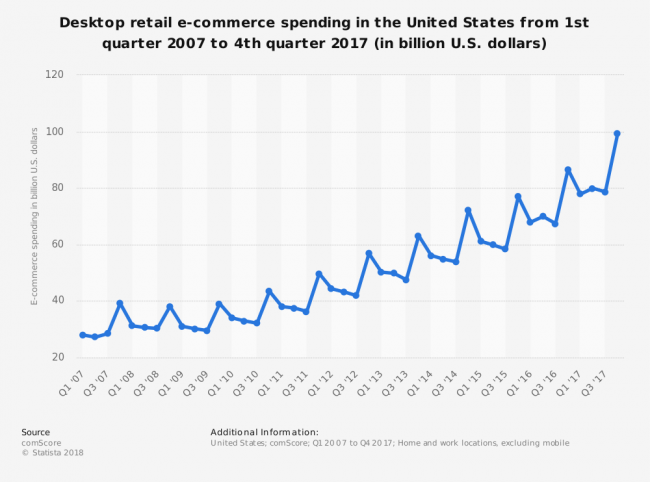 in q4 of 2017, consumers in the us spent 99.4 billion dollars on desktop e-commerce alone. And that’s not even factoring in mobile consumer sales! Total U.S. retail e-commerce sales are projected to surpass 700 billion US dollars in 2022 (Source: Statista DMO; Statista). How much of that will you miss out on while you wait months on end for our competition to build your e-Commerce site? Not only do we build e-Commerce websites, we create them efficiently and we make them as effective as possible. Over the years, we have streamlined the process of designing and programming sites that promote the sale of products and services. Because we recognize that time is money, your site will be up and running in no time. We integrate the e-Commerce function into the sites we program and host. We port them into our incredibly simple content management system, so that all you have to do is upload the data for your products and click “sell.” Of course, we’re not so nearsighted to blindly assume that every site we design, program and host will yield astronomical profits. If our e-Commerce sites sold product based on their looks, our clients would be millionaires. Unfortunately, pretty sites and optimized keywords don’t guarantee sales. In the end, it’s up to you – the business owner and seller of the product – to guarantee your business’s longevity in today’s online marketplace. But we’re here to exponentially increase the probability that you will achieve your goals.